Our Cedar Lake Two Drawer Log Wardrobe is constructed from naturally aged Northern White Cedar. Each log used is hand picked and hand peeled to preserve the natural beauty and character of the wood. The hand peeling process leaves some of the cambium (inner bark) on the logs and also leaves behind any burls, knots, and beetle tracks. 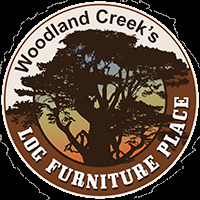 This ensures each log used in our Cedar Lake Cabin Bedroom Collection of furniture will be unique and help create unique, beautiful, rustic furniture you will enjoy for years to come.